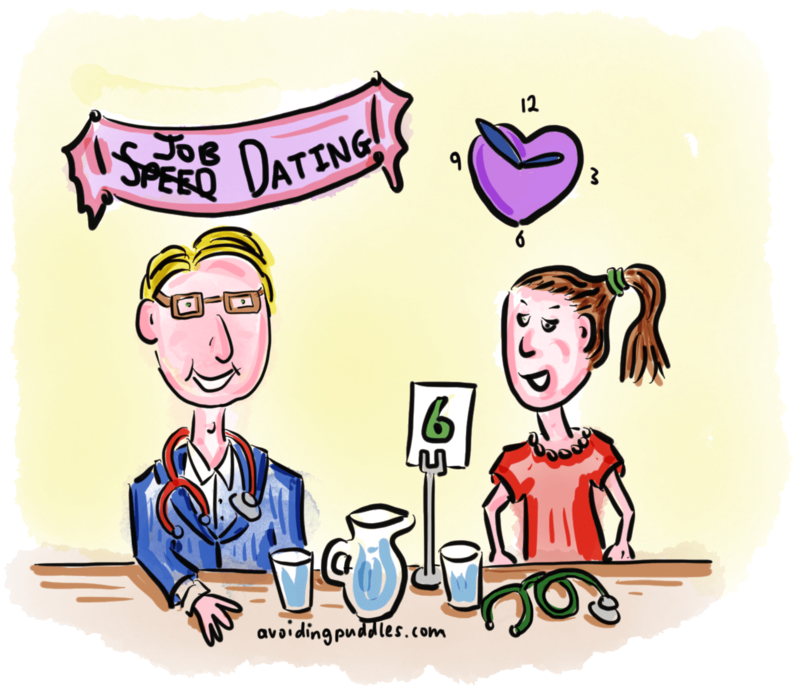 The worlds of speed dating and GP recruitment, together at last! Ask Practice Managers and GP Partners to list the challenges currently facing their practices and GP recruitment will poll high on the list. Practices are facing a perfect storm of factors making it difficult to find and keep salaried and partner colleagues. Senior GPs are making an early dash for the exit and juniors are looking to other specialities or to more work-life balance friendly overseas or locum roles. The issues almost roll off the tongue. Pension caps, insurmountable workloads, business uncertainty and risk, premises issues, increasing patient demands, more regulation, higher indemnity costs, the recent GP bashing mood of the media, and active recruitment by sunnier parts of the world. It’s enough to make even the most dedicated partner consider their position. In many areas, even finding locum GP cover means using expensive agencies to find someone to drive across counties to the practice. It is not unusual for vacant sessions to go unfilled adding to the pressure on remaining staff. Fresh thinking and innovation can throw up novel ideas and solutions to complex problems and turbulent times. In 1439 Johannes Gutenberg combined the wine press and the coin punch to create movable type and the printing press. He revolutionised the world. In March this year the the RCGP Vale of Trent Faculty applied an innovative idea to the problem of GP recruitment and retention in the East Midlands. Perhaps not quite in the same league as the printing press, but exciting none the less. GP Speed Job Dating was born. The event brought 60 final year GP trainees and First5 GPs together with GPs and representatives from 24 East Midlands Practices. Practices from all corners of the Vale of Trent area were able to attend. Trainees spent 3 minutes talking to every practice in attendance. The aim was to maximise the number of connections made between new GPs needing work and Practices looking for staff. The hope was to improve retention of GPs in the area after completion of training. Trainees can have fixed ideas about the location and type of practice where they want to work. But, this can lead them to overlook great jobs with fantastic teams in unexpected or offbeat places. New GPs were able to meet practices from places they might not have naturally considered working. Practices were given an opportunity to be able to “sell” their teams and areas to a wide audience of potential recruits. How did VoT Faculty organise their event? Combining the session with an existing popular event will increase the chance of success. The event took place over lunch time at the faculty’s annual GP VTS Leavers Day Conference. This ensured the attendance of 60 ST3s and First5 GPs fresh from exams with minds focused on finding work. Once practices were aware of the event and it’s aims they were very keen to attend. But, reaching busy GP Partners and Practice Managers can be difficult. Promote the event early and use multiple channels. Discuss in local meetings, use all available mailing lists, promote through other organisations who share the recruitment and retention challenge, use catchy flyers and word of mouth. LMCs, RCGP and CCGs will all be willing to help out. New GPs can sometimes be shy. They might already have a job in mind. Show them that this can also be a great opportunity to practice important networking and interview skills. Once the event gets going it will be confusing and very LOUD. Practices need tables with numbers. New GPs need to know to move to the next number at the ring of the bell (seriously, bring a bell). You will need some marshals to help keep confused GPs flowing in the right direction. At the end of the event, participants will need some time scheduled to reconnect with the people and practices they found interesting. To exchange details and arrange to meet again. Be clear and up front that GPs and practices are responsible for doing their own due diligence. Nobody has been approved or vetted. The event is merely about encouraging connections. Feedback received about the event was very positive from both new GPs and Practices. A number of “second dates” have been arranged and positions secured following introductions made at the event. The Faculty is already planning their next GP Speed Job Dating Event. Of course, speed dating was extremely popular 10 or so years ago. But the world has moved on since then. It seems that now the world of dating is all about apps. Will next year bring a Tindr for GP jobs? Would that be a good idea? Swipe left for no, swipe right for yes. What a brilliant idea to make contacts! Another good read Dr Puddle keep it up! Thanks “Mum & Dad”. It’s great to have your support. Your name sounds familiar. It feels like we might have met before :-). Why thank you Mr/Mrs “Coupon Codes”. Your comments are much appreciated. I wish you and the Codes family all the best for the future and hope you keep visiting the blog.